Quiet, strong and spectacular! The Alphacool Eisdecke Plexi is the perfect pump top to take your pump to the next stage. Make your Alphacool DC-LT, Laing DDC, Eispumpe VPP755 or Laing D5 pump a show piece with this attachment! Thanks to the multiple 1/4" threads the Alphacool Eisdecke is the universal companion for every pump. 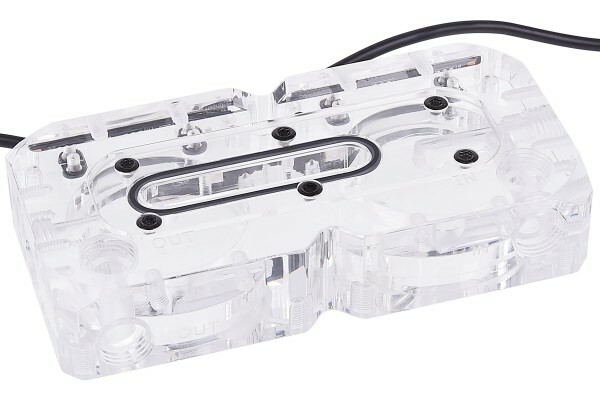 With the Dual attachment you can even connect two pumps in series and maximize the performance of your water cooling. Alphacool gives you the flexibility you need. It doesn’t matter how you want to place your pump in your system, the Alphacool Eisdecke can accommodate it. You want to mount your pump vertically, horizontally, at a 45° or 90° angle – no problem. The included feet give you the greatest possible variety of mounting options for your case. The clear acrylic with pre-assembled RGB strip makes the Alphacool Plexi Eisdecke shine like a diamond. The 4-pin male RGB connector makes your top compatible with all common controllers. The new, patented screw plugs with their ultra-flat design nestle perfectly to the Eisdecke making a clean, sleek look. The Alphacool Eisdecke can be equipped with vibration dampers that make your pump quieter than ever before. Remove distracting noises and ensure you gain the performance you need, the Eisdecke should be seen, not heard.